So, what’s with those soup balls? The story goes that one day, President George W. Bush went out to dinner with a Jewish friend, and the friend recommended a kosher place nearby. They arrived, and W’s friend ordered them both the house specialty: matzo ball soup. The waiter brought the bowls, and W looked at the soup suspiciously. His friend urged him to try at least one taste. So, he took a bite of matzo ball and slurped some soup and clearly liked it. So just what’s with those balls? Matzo balls—or kneydlekh in Yiddish—are Ashkenazi (eastern European) Jewish soup dumplings made from a mixture of matzo meal (ground matzo), eggs, water, dill, other spices and a fat, such as oil, margarine or chicken fat (schmaltz). Most Jewish cooks prefer schmaltz to any other fat. 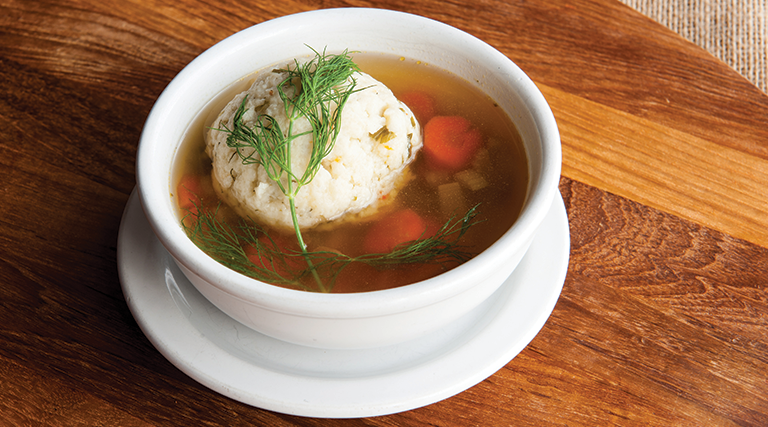 Matzo balls are traditionally served in chicken soup and are a staple food on the Jewish holiday of Passover. Schmaltz imparts a distinctive flavor and is credited with some of the healing properties of chicken soup. The proteins found in the fat are said to stimulate the immune system to help ward off colds and flus. After the matzo balls are formed, they are dropped into a pot of salted boiling water or chicken soup, then the heat is turned down to a simmer and a lid is placed on the pot. The balls swell during the cooking time of 20 to 30 minutes. From a golf-ball-sized beginning, they can swell to the size of a baseball if made properly. “Please taste the soup,” Lou says again to Gavin. “But there’s nothing wrong with your soup,” Gavin says. “For the third time, Gavin, I ask you to please taste the soup,” Lou says. “Ah-ha!” shouts Lou with a big smile on his face. Michael Feldman owns Feldman’s Deli in Salt Lake City.